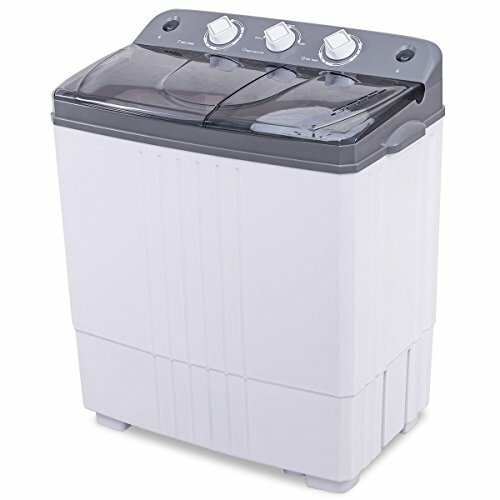 The twin-tub washing machine is a perfect solution to doing laundry in a compact environment. The two tubs, one for washing and one for spin drying are useful to you. The machine runs off 120 V power and will take up to 10 lbs capacity for washing and 6 lbs capacity for spinning. The machine features a drainage tube which allows you to easily drain out dirty water. Not only is it environmentally friendly but also it is energy saving. When you turn on the water you have to stay by the washer to watch it because it does not stop filling with water by itself. The washing machine with gravity drain also has separate timer control settings for wash and spin operations.